Applications are invited from the eligible candidates for One (1) post of Driver in the Office of the Sub-Divisional Judicial Magistrate, Rangia, Kamrup under the establishment of CJM, Kamrup, Amingaon. Age: Candidate must not be less than 18 years or more than 43 years of age as on 01.01.2017. In appropriate cases, relaxation of age will be admissible as per the existing rules of the Govt. of Assam. How to apply: Application in standard form as published in Part- IX of the Assam Gazette with self-attested copies of all testimonials in support of age, education, qualification, caste, experience, if any, along with three (03) copies of recent passport sized photographs must be submitted. The applications must indicate prominently the name of the post applied for on the right hand corner of the envelope containing the application. One self-addressed envelope of 5 cm x 11 cm affixing postal stamp of Rs. 5/- (five) is to be enclosed with the application along with the mobile number, if any. Applicants those who are in service should submit their applications through proper channel with NO Objection Certificate from his employer. The date, time and venue of the driving test will be notified in due course. Eligible candidates will be called through call letters for appearing in the driving test. The date, time and venue of the test will be mentioned in the call letters and will be notified in due course. The date, time and venue of the same will also be uploaded in the official website www.ecourts.gov.in/kamrup. 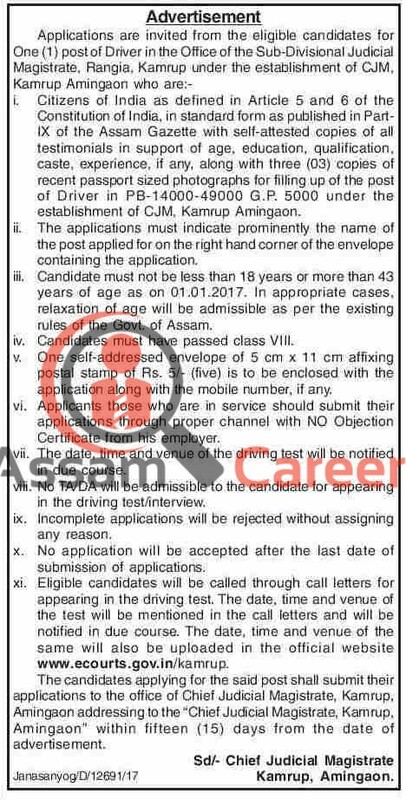 The candidates applying for the said post shall submit their applications to the office of Chief Judicial Magistrate, Kamrup, Amingaon addressing to the “Chief Judicial Magistrate, Kamrup, Amingaon” within fifteen (15) days from the date of advertisement (19/01/2018).